Interviewer Luan Gaines: For some of us, the Vietnam War is a vivid part of this nation's history, from the early years of the conflict to the anti-war demonstrations and the fall of Saigon in 1975. What is the promise of Operation Babylift for the orphans brought to this country? Aimee Phan: The Babylift brought attention to the fact that there were many, many victims of the war beyond what is read about and discussed in history books. We hear so much from the political figures and soldiers, but not nearly as much from the civilians, who were perhaps the greatest victims, those who had no control over the destruction of their country. The orphans, both Vietnamese and Amerasian, were born and displaced in a very tumultuous moment in history. They wouldn’t have survived in Vietnam after the war, which is why they were brought to the United States, Australia and Canada. The book deals with not only with consequences in the orphans’ lives, but many other civilians’ lives that were affected by the war and the Babylift. The evacuation saves many orphans only to transplant them into revolving-door foster homes, emancipation their only hope for independence. Others come to America via refugee boats, assimilated by families if they are fortunate. Can you contrast the problems faced by each group of orphans in their new country? Most of the Babylift adoptees remained in their adoptive homes, while unaccompanied minors and orphans who arrived later via the boat refugee exodus were not so quickly adopted. They tended to be older than the Babylift adoptees and consequently not as desirable for adoption. Both groups faced issues that all orphans experience, compounded by displacement and assimilation into a new culture. But for the boat refugee orphans who were in foster homes, they often did not have the same support networks that the Babylift adoptees had. They didn’t have families that loved them and supported them. Of the four orphans in Little Saigon, Orange County, Kim and Hung are from Operation Babylift, Mai and Vinh boat refugees of the 1980's. How significant are these differences as each character faces the future? They certainly represent the spectrum of experiences and emotions that are possible. While Kim and Vinh are incredibly bitter and resentful of their circumstances and blame everyone for their present problems, Huan and Mai are more diplomatic. Mai feels both guilt and frustration for her awkward position in having a good foster home, but never getting adopted. And Huan, who arguably has the most ideal situation of all the characters, still questions his identity as a half-black, half Vietnamese child raised by Caucasian American parents. Kim is a vocal and vulnerable Babylift orphan, the loss of her mother a wound that won’t heal. Why does Kim’s friendship with the shop owner she tried to rob fail so quickly? What are Kim’s expectations of this woman? Kim has amazing expectations of the woman because she is treating her like a mother, which the woman is not. When Kim realizes the shop owner does not share these feelings, she feels humiliated and once again, rejected by another adult in her life. Foster homes teach Kim that she is disposable, creating a lack of self-esteem and insecurity. No longer attracted to or impressed by Vinh, why does Kim stay with him? She’s scared. Kim and Vinh once had an intimate relationship. The fact that they share a bed after their breakup indicates how difficult it is for the pair to separate from each other. Kim and Vinh grew up together, sharing a very close sibling bond that developed into a sexual relationship. Of all her foster siblings, Kim felt that Vinh understood her best. He never judged her or lectured her to be a better person. On the contrary, he worshipped her. She took refuge in his gang’s protection because these were boys she’d grown up with and there was no one else to turn to. Vinh is a hardened youth who exploits the fears of his own people for profit, understanding the native fear of involving the police. A child with no family and no future, is there any hope for Vinh besides a life of crime or prison? Despite all his stupid decisions, I do think Vinh is capable of being a good person. He’s just surrounded by a lot of similar boys who’d rather act than think. Vinh’s salvation is the hope of creating a home and life with Kim. She is his first love, the only person who has seen him as a protector. He wants that to be his permanent identity. But Kim no longer wants to be with Vinh. She recognizes that their relationship is childish and unhealthy and in order for her to grow up, she needs to be away from him. Bac Nguyen is the invisible immigrant, the easy victim of predators because of his naturally self-effacing behavior. Is he not powerless against the hardened young men who take advantage of his fears? What is this old man’s place in the social fabric of Little Saigon? Bac Nguyen represents the older generation of Vietnamese refugees who arrived to the country too late to learn English and have to rely on their children and grandchildren to survive. It’s an incredibly humiliating experience for them, since in Vietnam, their social positions would be much higher than it is currently in America. Do you have a personal connection to Operation Babylift? Please explain. How does this connection inform your writing? My mother, aunt and uncle were all on the Babylift. My mother worked as a social worker in Orange County with Vietnamese foster children. I grew up hearing about their stories and hardships. They certainly impacted my perception of Vietnamese refugees in America. Your stories expose some disturbing truths about the war, the rescue efforts and the repercussions for the survivors. What are the chances for success, given their early handicaps and marginalization within American society? Of course circumstances and upbringing play heavily into a person’s character. But it’s also a person’s nature that determines what he or she does with those circumstances. How do life challenges differ for the post-Babylift characters, Kim and Huan, and the boat refugees, Mai and Vinh, as they mature? They handle them all so differently. While Kim and Huan were both on the Babylift, Huan’s adoption worked out and Kim’s didn’t. Because of this, Kim’s life followed a very different path that was difficult and painful for her. Mai and Vinh were also affected by their foster care upbringings: Mai thrived under her supportive parents, while Vinh dropped out of school because his foster parents didn’t care. “They wanted to give back their pain.” Does this statement reflect the rage and displacement of those characters who have not found this country a safe or provident place? In what way? The statement is a violent, frustrated reaction to the dissatisfaction and anguish they feel about their lives, which they blame on racism and the privileged power structure. They think America is to blame for their unhappiness and their only means of action is to return the injustice against people that represent America and assimilation. Vinh perpetuates the same injustices he has known, victim becoming victimizer, but Mai prepares to go to college and take her place in the world. Why have the lives of these two boat refugees turned out so differently? Can anything break the cycle of violence for Vinh? Mai and Vinh were raised in very different foster homes, which facilitated the directions their lives would take. Better communication is needed to break the cycle for Vinh and many boys like him. It is sometimes difficult for people of different generations to speak to each other in a beneficial, productive way. Older refugees do not understand the difficulties their children experienced growing up in America, while the children have little idea what their parents endured and sacrificed to escape Vietnam. They can only see their own pain. Until they understand and respect the feelings of both elder and younger generations, they will continue to misinterpret each other. What does the country of their birth offer the returning orphans who are trapped between two cultures? Is there a home to return to? It’s a case by case situation. Some can return and find resolution, others cannot. When I went back to Vietnam, I never felt more American in my life. But there is naturally a comfort and delight in seeing the country your ancestors are from, a country full of people who look like you and speak the language of your family. For my characters, the return is complicated by so many factors. While Huan and Mai found some level of comfort returning to Vietnam, I’m not sure Vinh and Kim would share the same experience. Although written as linked stories, We Should Never Meet reads like a novel for me. Will any of these characters return in your future work? Are you currently working on a novel? I am currently working on a novel and I have the temptation to bring back some of the characters because both books are set in the same world (Little Saigon, California.) We’ll see. It’s too soon to tell. I want them to come in where it makes sense. I don’t want to put them in the book just to wink at readers. Are there any particular authors who have influenced your writing? I love Jessica Hagedorn. Her writing is ambitious, confident and smart. I also like Gish Jen for the same reasons. Do you have any suggestions for would-be writers? Read! So many beginning writers need to read a lot more than they are doing. If you don’t know what writers are doing in contemporary literature, then you’ll be writing in a vacuum. Reading exposes you to all the different styles of writing necessary to naturally formulate your own. There’s no such thing as a writer who reads too much, while there are many who do not read enough. Aimee Phan was born in 1977 in Orange County, California, and now teaches creative writing at Washington State University, where she is at work on a novel. Visit her web site at www.aimeephan.com. 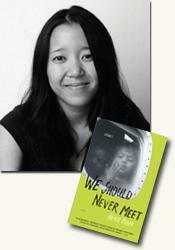 Contributing reviewer Luan Gaines interviewed Aimee Phan, author of We Should Never Meet: Stories (see accompanying review), about his book via email for curledup.com. No part of this text may be reproduced without permission. Luan Gaines/2005.